TZ HYEC Cafe - no worse than the previous instance, just as it is perfectly adapt to any screen - the mobile phone to a projector! Developed by a team of professionals from Templaza platform T3 Framework in pleasant and not annoying eye colors, complemented by qualitative features publishing articles on TZ Portfolio. 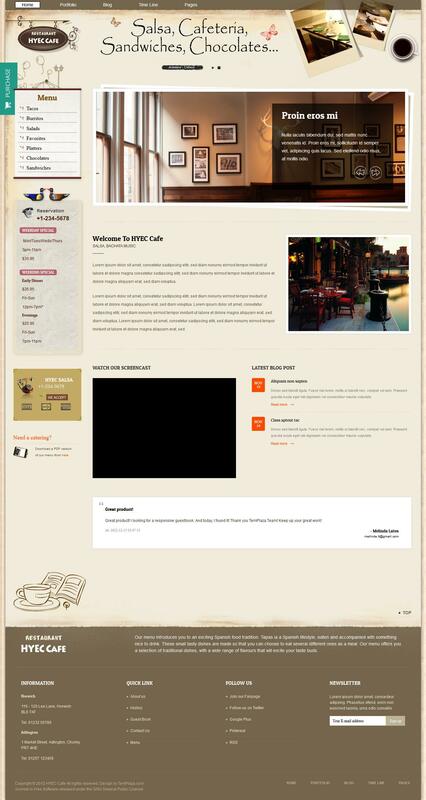 And what else is needed for a website about food in restaurants, bars and cafes? Any recipes and photos will look elegant and do not irritate the eyes unnecessary for this theme with bright colors. Another advantage - the use of modern service guestbook TZ Guestbook, he will surely enjoy your visitors and you yourself - function adds convenience of viewing and adding comments, and this is one of the components of the project's success!